Infertility is a topic rarely discussed. Most couples struggling to conceive know almost nothing about fertility and treatments until being thrust unprepared into the world of reproductive endocrinology. Once one is handed the ticket into this world of endless doctor’s visits, self-injections, and failed cycles, the cyclical sadness, disappointment, and shame can drive people into secrecy. Struggling to have a child, be it one’s first or any subsequent child, can create a constant feeling of loss and helplessness. 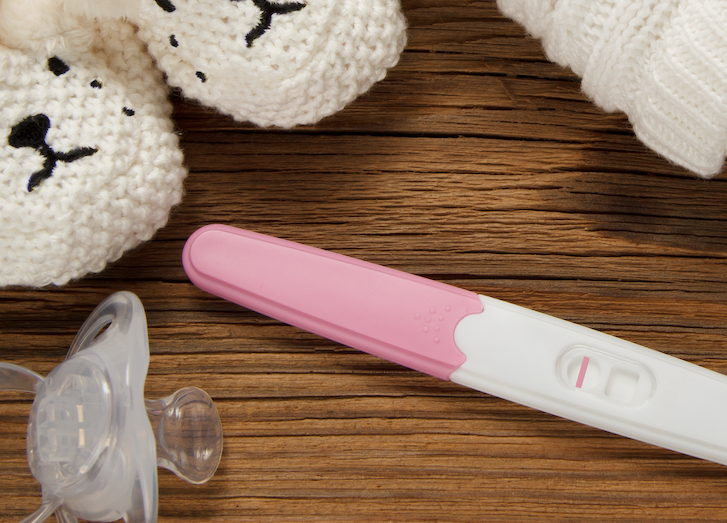 For Jews, there is an added stress of infertility. Many of the Jewish holidays and rituals revolve around children. For those struggling to have a child these holidays and rituals can be very difficult. For some these holidays can even be a source of tremendous pain, as a reminder of what they don’t have, yet so desperately want. Taking the first step on this journey can be very frightening, nerve racking and anxiety provoking. By starting down this road one is admitting that there may be something wrong. Deciding to seek medical or other interventions it is a very brave step into a previously unknown world of seemingly endless medical treatments. Infertility is a challenge faced by approximately 1 in 8 couples. The process of fertility treatment is time consuming, emotionally grueling, physically demeaning, and financially tasking. Many couples will be required to undergo multiple treatments to achieve a pregnancy, and for some couples these treatments may never result in a live birth. For most Jewish couples who want children, building a family is a given. But for many couples diagnosed with infertility, the road to parenthood is paved with tears, anguish, loss, isolation, and depression. 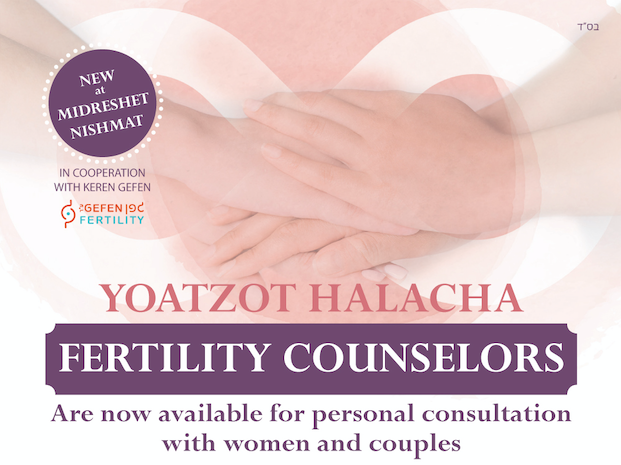 Nishmat’s Yoatzot Halacha Fertility Counselors offer consultations to provide information and assistance with Halachic issues related to the fertility journey. After an extensive post graduate fellowship in cooperation with Keren Gefen, the Yoatzot Halacha Fertility Counselors are now an expert address in the medical, halachic and psychological aspects of fertility issues. With unique sensitivity, the counselors can assist women and couples to navigate the complex halachic and personal dilemmas surrounding fertility treatment. To set up a consultation, email us at fertility@nishmat.net or fill out the form here. The Gefen Mind-Body Fertility Organization, provides psychological and emotional support for fertility-challenged women at minimal cost. Innovative programs include Mind/Body Therapies, CBT Counseling, Yoga Fertility Workshops and Complementary Treatments that are designed to reduce stress, relax bodies and regain spirit. Yesh Tikva, Hebrew for “There is Hope,” was established to end the silence and create a community of support for all Jewish people facing infertility. Yesh Tikva gives a voice to these struggles, breaks down barriers and facilitates the conversation surrounding infertility. Yesh Tikva offers a rich website (www.YeshTikva.org)and many support services. What is infertility? Infertility is defined as the inability to conceive after 1 year of trying for women under 35 or after 6 months for women over 35, or the inability to carry a pregnancy to live birth (recurrent pregnancy loss). How does infertility impact one’s mental health? An infertility diagnosis can create a significantly distressing life crises, especially as a member of a Jewish community where others are building and expanding their families and most rituals revolve around family and children. The inability to conceive and the loss of potential create significant feelings of loss, similar to the loss of pregnancy. Additionally, dealing (usually alone) with multiple medical decisions, lengthy waiting periods, uncertainties, and the loss of control, leads high levels of emotional distress and turmoil for many individuals and couples. What causes infertility? About a third of infertility is attributed to the male partner, a third to the female partner, and third is attributed to factors in both partners or is diagnosed as “unexplained infertility.” Though many people think of infertility as a women’s problem however men are equally affected. How can infertility be treated? Many different treatment options exist, including drug therapy, surgical procedures, and reproductive technologies such as Intrauterine Insemination (IUI) and In Vitro Fertilization (IVF). Consult with an IVF/Infertility Consultant or Reproductive Endocrinologist is recommended for thorough investigation and treatment plan. What is recurrent pregnancy loss? Approximately 20% of all pregnancies will end in a miscarriage due to a nonrecurrent cause. Recurrent pregnancy loss is the loss of two or more consecutive pregnancies. A pregnancy loss is defined as a clinically recognized pregnancy ending before 20 weeks gestation. What are the causes of recurrent pregnancy loss? Some of the causes for recurrent pregnancy loss include chromosomal abnormalities, blood clotting disorders, autoimmune disorders, uterine or cervical abnormalities, untreated infections including chlamydia and gonorrhea, advanced maternal or paternal age, as well as unexplained factors. How can recurrent pregnancy loss be treated? Several treatment options exist, including medical therapy, surgical procedures, immunotherapy, and reproductive technologies including In Vitro Fertilization (IVF) with Preimplantation Genetic Screening(PGS). What is egg freezing? Egg freezing is a form of fertility preservation for future use in an IVF cycle. This involves stimulating egg production (as done in the first phase of an IVF cycle) for retrieval and storage. Is egg freezing a guarantee for achieving future pregnancy? Egg freezing is not a guarantee for achieving future pregnancy. The chances of success depend on the woman’s age and ovarian reserve at the time of egg freezing, and the number of eggs retrieved and frozen. The chance that one frozen egg will yield a baby in the future is around 2-12%. Therefore, when considering egg freezing it is important to undergo ovarian reserve testing and consult with a doctor to ensure individualized expectation management. It is important to note that no two people suffer or react identically to similar situations. The following are suggestions; be sure to consider each individual and his/her experience and apply what you deem to be most appropriate. Do not assume anything; not everyone who does not have a child or has a large gap between children is navigating infertility. If someone reaches out to share his/her story, the best thing one can do is listen. Be cautious of offering any medical suggestions or referrals unless asked. When offering, an individual or couple, the opportunity to participate in a ritual that is thought to help one have children it is important to know who you are asing before doing so: ▪ Some people appreciate such offers and run at the opportunity ▪ Some people feel very hurt by such an offer and would prefer not to even be offered them. When hosting a meal or get-together, ensure that everyone is made to feel emotionally included: Be aware of the crowd. If there are individuals who are not married or do not have children, make sure that the conversation does not revolve around marriage and kids. Try to engage in conversations in which everyone can be an active participant. A text message every so often just to say hello can go a long way in making someone feel that you care. Invite family members and/or friends to birthday parties, get-togethers and Shabbat or Yom Tov meals — if they are not up to joining, let them make the decision for themselves and do not make them feel guilty for opting out. The best thing that one can do for a friend or family member is be a friend, listen when they speak, and offer a shoulder to cry on if need be. If a friend or family member does share his/her story with you, try not to bring it up every time you see him/her. Assuring people that everything will be okay is generally not comforting, as only God knows the outcome. Rather, assure your friend or family member that no matter what the outcome, you will be there for them in any way that he/she needs. Validate feelings or reactions s/he might have. Provide them the space to experience those feelings without feeling judged. At times those struggling with infertility, be it primary, secondary or circumstantial, can become emotionally overwhelmed and may need some distance. It may come across as a personal offense, but it is important to remember that it is not personal. Yesh Tikva, Hebrew for “There is Hope,” was established to end the silence and create a community of support for all Jewish people facing infertility. Yesh Tikva gives a voice to these struggles, breaks down barriers and facilitates the conversation surrounding infertility. Nishmat’s Yoatzot Halacha Initiative and Keren Gefen Mind Body Fertility Organization, are pleased to partner with Yesh Tikva’s Fourth Annual Infertility Awareness Shabbat. This Shabbat is aimed at raising awareness of and sensitivity towards infertility in our Jewish communities. This Shabbat, Rosh Chodesh Nisan, April 6, 2019, over 100 synagogues will join with Yesh Tikva and partnering fertility organizations to share a message or D’var Torah that helps enhance communal understanding and facilitate empathy for those who struggle to build and grow their families. This year we are pleased to be partnering with many other great Jewish fertility organizations, Australia Jewish Fertility Network (AJFN), Fruitful AZ, Hasidah, Jewish Fertility Foundation of Atlanta (JFF), and Feit 4 KidZ Fertility Fund of JFLA.